Home » Are Electric Gates Ideal For You? Whether it is for your home or commercial property, electric gates have become a popular option. But what are the advantages of having electric gates and are they the right option for you? LT Garage Doors Ltd install electric gates to all properties throughout Cheshire and the surrounding areas. We have a range of designs and styles available for you to choose from. Electric gates have surged in popularity due to one of its main features being added security. Whilst security gates have usually been prioritised for commercial properties, they are now becoming more and more important for your home. Electric gates offer maximum security to every home, depending on the style and design you choose. Whilst it may not completely prevent people from getting on your property, it does make it more difficult for individuals to access your property. They can also be installed with security features such as key code technology. This prevents the gates from opening without using your remote control or passcode. Some may call it laziness, but electric gates can greatly increase the convenience of your life. Especially if you have vehicles on your drive or property, these gates mean you never have to leave your vehicle when accessing or leaving the property. With remote control technology, gates will open and close whenever you require, allowing you to move freely without ever having to open the gate by hand. 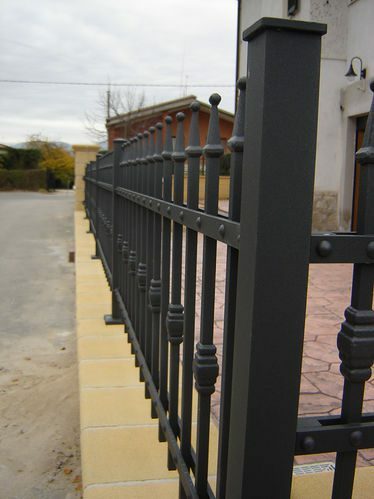 This is ideal for most properties, especially where heavy gates are required. You want to make opening gates as simple as possible and electric gates are the perfect way for this to be achieved. Not everyone will need this added convenience. However, electric gates are very easy to use and stop the struggle of opening and closing your gate every day. Electric gates can often be larger than the normal gates your property will have. Despite this, you can be assured the appearance and style of your property will never drop. Our gates offer a huge selection of styles, colour schemes and many intricate details. They can always be manufactured bespoke to the design you would like, so their appearance should keep you satisfied. As our team manufacture all gates, this also means any broken or lost remote controls can be replaced quickly. Throughout the design process, our team can advise you on the best choice for your needs. We make sure you are left fully satisfied by the style, design, colour and features or every gate. Are Electric Gates Only For Commercial Properties? In the past, electric gates have mainly been used for commercial properties but due to the features and designs now available, they are also ideal for your home. Your gate is the door to your property and garden and it is important this style reflects the rest of your home’s appearance. You should always consider what you want from your gates, other than looking good. Electric gates now offer fantastic designs, whilst providing a number of other features to every home. For both security and style, they are becoming the best option for your home. Electric gates can also increase the value of your home as a long-term investment, making them even more popular to all homeowners. If you would like to install electric gates in Cheshire, Stoke, Macclesfield or any of the surrounding areas, speak to LT Garage Doors Ltd today. We can always provide a fast response and talk you through all the options for our gates. Call us on 01782 533 552 or 01625 886894 or fill in our contact form to make an enquiry.